After scoring a first by amassing the biggest opening day total at the Box Office, Salman's 'Ek Tha Tiger' has notched up yet another first - that of becoming the first Indian movie to surpass the 100 crore collection mark fastest. Yes, in its first five days, 'Ek Tha Tiger' has crossed 100 crores and the collections of Eid are yet to come in. Going by this, it is very well possible, that 'Ek Tha Tiger' may cross 125 crores in the first six days of its release. Salman's name has become synonymous with Eid as per his own admission in a newspaper and Salman is at the height of his superstardom. Starting with 'Wanted' Salman has not looked back and has gone from pillar to post in terms of giving hits. It remains to be seen if 'Ek Tha Tiger' will be able to cross the box office collections of his good friend Aamir Khan's '3 Idiots'. But suffice to say, that the kind of hysteria seen on the opening day of 'Ek Tha Tiger' is testimony to the fact that Superstar Salman has a long innings in front of him! Memsaab wishes him all the best and Eid Mubarak! 'Chennai Express' becomes the fastest Rs.100 crore Bollywood movie! Salman Khan Pays Rs. 8 Crore in Advance Tax! Salman Khan - Ek Thanda Tiger!!! On the sets of Ek Tha Tiger!! 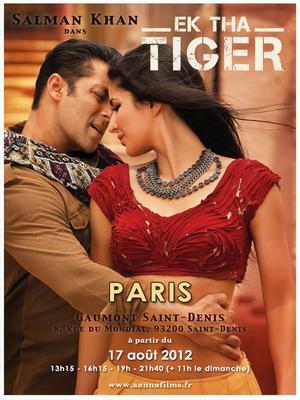 Do You See Similarity Between Tiger and Salman? Did The Tiger Impress Audiences? Salman Khan: Tiger or Sher?